This light fixture is exactly as pictured. This was an easy but effective update for a outdated bathroom. Provides great light and exactly the ambience I was seeking. 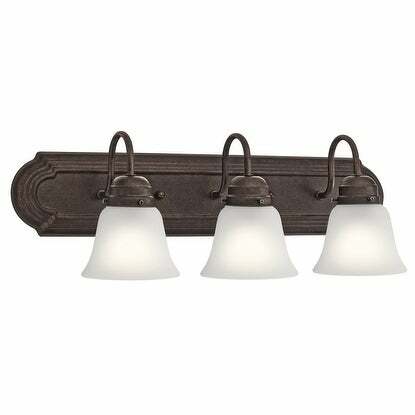 This 3-light bath/vanity light features a tannery bronze finish that will complement many traditional decors. Clean lines of the steel frame add interest while satin etched glass shades soften the light to create a warm ambiance for any bathroom or vanity space. Beautiful Tannery Bronze finish with contrasting Satin Etched glass shades. Great fixture and match to bronze hardware in powder room bath. Easy installation too. I read other reviews as I typically do to get an idea of how sturdy, and well made it was. I know of Kichler Lighting to put out a great product, however it’s difficult sight unseen - which is why I go through reviews both good and bad. Reviewers seem to share different perspectives on what’s important to them. For me it’s quality as well as looking more costly or luxurious than what I’m paying, at least when it’s something that isn’t going to be handled or examined up close such as a hanging or wall light fixture. Unlike Table lamps of course which are more subjective to be handled and viewed. This fit the ticket for me. I will not hesitate to purchase Kichler again. Overstock is as always great to work with! I love how this light looks in my small half bath. The lighting is great, it looks good, and it shipped quickly. It was easy to install, too. I love it! Very nice and pretty, Easy to hang and looks fabulous! I would recommend this product! Nicely priced, but has that expensive and elegant look.